We only sell proven, high-quality water softener and conditioning products – so you can be confident that our solutions will achieve the quality results you’re after. We are also able to provide water filtration, and reverse osmosis for your drinking water needs. Conditioned Water Does Make a Difference! Many water supplies contain hardness minerals (calcium and magnesium). These minerals form a scale and create problems in water heaters, washing machines, dishwashers, coffee makers, humidifiers and plumbing systems. The modern and efficient water softener systems described in this website eliminate hard water problems. It removes calcium and magnesium from your water supply by filtering it through a resin softening medium. Salt is used revitalize the system periodically to provide soft water for your daily needs. 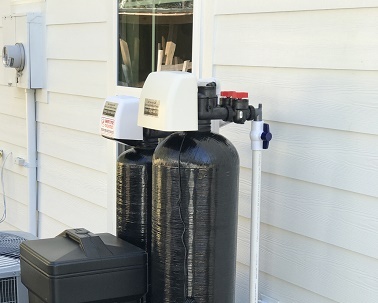 The control for this water softener system is designed and engineered to give you reliable operation and conserve the water and salt required in the regeneration process. Take a close look at all of the advantages and you'll find that conditioned water makes a refreshing difference in your life and will save you money now and in the years ahead. Conditioned Water Will Save You Money! Hard water impairs the cleansing strength of detergents. Conditioned water not only delivers greater washing power, it reduces soap requirements (up to 70%). Protects your washing machine at the same time. Tired of streaks and spots on glassware and dishes? Conditioned water eliminates the problem, and helps your dishwasher last longer, too! Red, roughened hands are usually the by-product of hard water. Conditioned water caresses - doesn't irritate. Clothes last longer; come out fresher, cleaner and softer when washed in conditioned water. Colors stay brighter too. Bring conditioned water to your bath or shower and you'll feel a refreshing difference. You'll wash "really clean" faster and without soap build up on your skin. You'll come away more relaxed and refreshed. Say good-bye to razor burn as your razor glides smoothly over your soft water conditioned face. Both your skin and blades will last longer. A conditioned water shampoo revives hair color and makes it more radiant and manageable. Conditioned water adds longer life to your water by minimizing the scale build up created by hard water minerals and saves you money! Less energy is required (17% to 21%) to heat water in tanks without a scale build up. Washing floors, tile, and woodwork goes much easier and faster with conditioned water, because it eliminates the film and soap scum that hard water causes. All bathroom fixtures benefit from conditioned water. There will be no more unsightly rings, stains, or mineral build up to darken your porcelain or your day. Read the current water quality results for St Johns County.